Flair Espresso Maker is a practical, elegant and a long-lasting machine that will easily provide you with a quality custom double shot espresso. The machine comes in a custom carrying case, which makes it handy for transport, and that is one more thing which makes it perfect for travel. You can check and other portable espresso makers excellent choices for travelers, campers, hikers and all of these manual portable espresso machines will afford you to enjoy anywhere in your favorite drink. 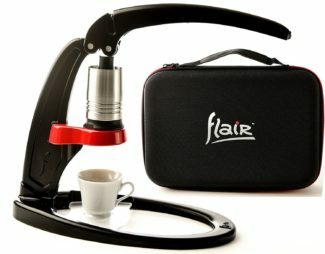 Flair quality is better then most other portable espresso makers and even can be compared with some professional machines. So let’s find out more about Flair characteristics. to experiment with different pressure levels. Flair Espresso Maker weighs 4 lb 4 oz and it’s 10 inches tall. The cylinder water capacity is 65 ml while the shot volume is about 50 ml. Pressure generated by pressing down handle: 9 – 16 BAR. Shot extraction doesn’t last longer than 25 seconds (about 8 BAR) to 45 seconds (16 BAR). Portafilter has the capacity from 16 to 24 grams of grounds (which depends on the coffee beans). The case size dimensions are 12½” x 9″ x 3¼” while footprint dimensions are 12” x 6”. What are the parts of Flair Espresso Maker? high-quality non-pressurized portafilter, cylinder, piston, funnel, measuring cup. It also comes with its own measuring cup for whole beans, so if you want a perfect shot, fill this handy cup to the top. The cup can also be a perfect means of tampering and piston removal. All of the listed components are combined to create an easy-to-use machine with a minimalistic retro eco-friendly design. How to Use Flair Espresso Maker? You should pre-heat the hot water cylinder. The best way to do so is by letting the water boil for a couple of seconds and then pour it over. When you grind beans, especially the freshly roasted ones, make sure to use a quality burr grinder and to grind them a little coarser. Don’t forget to tamp firmly! Be careful when pressing the handle. You shouldn’t force the handle down in case you notice it’s resisting too much. In case you do, the best thing for you is to start over the process, this time with a looser tamp or a coarser grind. Don’t overfill the basket! If you put an excessive amount of ground beans in the basket, you won’t have enough space for the shower screen to fit adequately. Flair Espresso Maker pretty much makes a good competition not only for the appliances in its own price range but also for more expensive and complicated espresso makers, offering a complex, thick and rich shot. Affordable, portable, working without electricity and really simple to use with practically no maintenance. So, if you are not really into giving large amounts of money for a coffee maker but at the same time you want to drink quality coffee, Flair Espresso Maker can be a pretty good solution for you, especially for travel. It is also a perfect solution for those of you who don’t have a lot of space on the kitchen counter and don’t want to spend a lot of time cleaning it up. If you want to have your own espresso with one button press Flair is not for you. 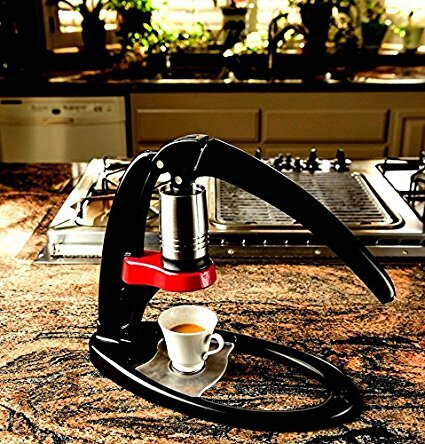 This espresso maker is more for coffee professional or home barista. For you, which is espresso maker is better, ROK or Flair?